The Three Chimneys is a very well known restaurant in a remote area of Skye which has a great reputation for its food. We’d fancied going there for a while, but the distance and lack of time meant that there was always a reason to put it off. This time, for my wife’s birthday, we decided that we would make the effort so we finally got there last weekend. High standard restaurants always now seem to think it necessary to provide canapes and an amuse bouche. I’m not convinced it’s that necessary but the fish soup at the Three Chimney’s, which was the amuse-bouche was excellent. 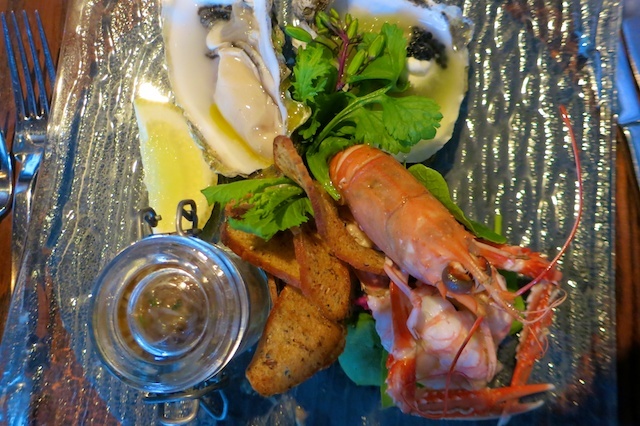 From the short menu, I chose the ‘Skye Lochs Fruit de Mer’ – local crab pate, oysters, langoustine and prawns – as a starter. 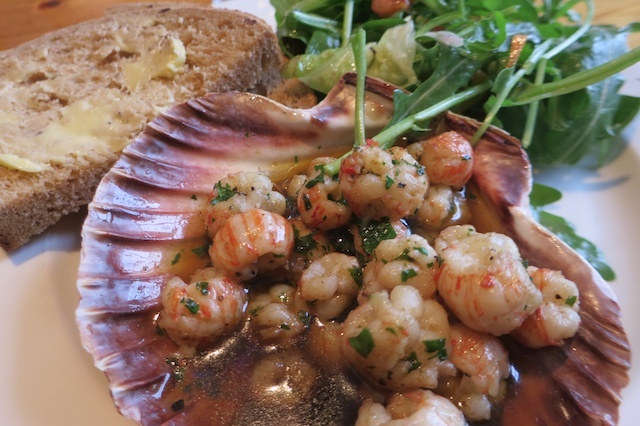 It was absolutely superb – beautiful fresh local seafood. Given I’d eaten nothing but seafood for the past 2 days, I decided that I had to stick with the fishy theme and chose a dish a was a wee bit dubious about – fish cooked in red wine. In fact Minch Lythe (Pollack) cooked in Claret with Scallops. Again, I thought this was a faultess dish – the red wine was not at all obvious but the fish had a deep flavour from it. I thought the use of the archaic Scots word ‘Purry’ – meaning a puree, was a wee bit pretentious, but that didn’t take away from the deliciousness of this dish – one of the best fish dishes that I’ve had for a while. Claret poached Minch Lythe, Seared Sconser Scallop, Anna potatoes, Choucroute of Savoy, Split Pea and Cauliflower Purrys. 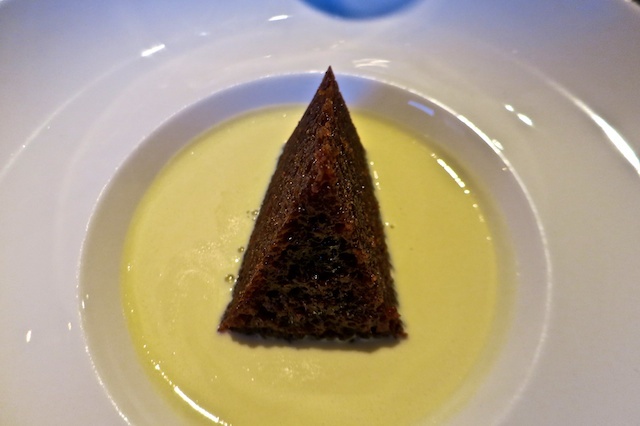 My pudding was the Three Chimneys’ signature dish – Hot Marmalade Pudding with Drambuie custard. For me, this was the weakest dish – there was nothing wrong with it but I thought that it lacked the complexity of flavours in the other courses. Maybe I’m not really a hot sponge pudding person. Overall, however, it was a superb meal – well worth the trip. 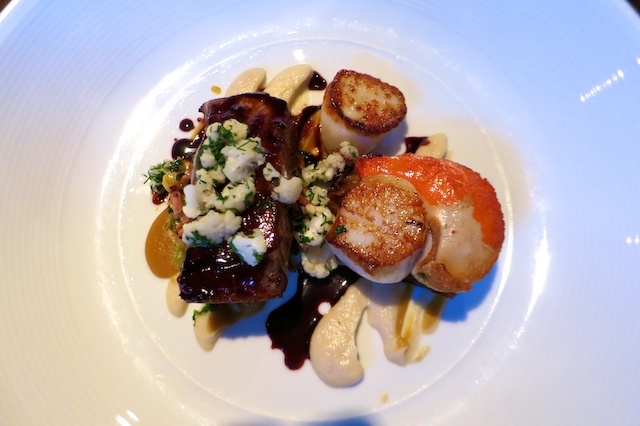 I thought the service was helpful and impeccable and the resto had a great atmosphere – not at all stuffy, which is sometimes a problem in expensive, country house restaurants. We stayed in the adjacent ‘House over By’ – there are 6 rooms available. The standards here are incredibly high – great, well-equipped, very comfortable rooms. My only complaint is that the duvets are stupidly thick and we were far too hot at night. Perhaps these are designed for visitors who are not used to Scottish temperatures. I am an inveterate hotel hater – I much prefer renting a house or apartment on holiday. There are very few hotels that I’ve stayed in where I’d wish to go back but the House over By is one of them – although I’d ask for a thinner duvet next time. It’s expensive – for both the rooms and the meal – very definitely a special occasion place. The meal was £60/head and we had a couple of bottles of wine (between 4) which were about £40 each. But when you compare the quality and location with some places in London, it’s a bargain. 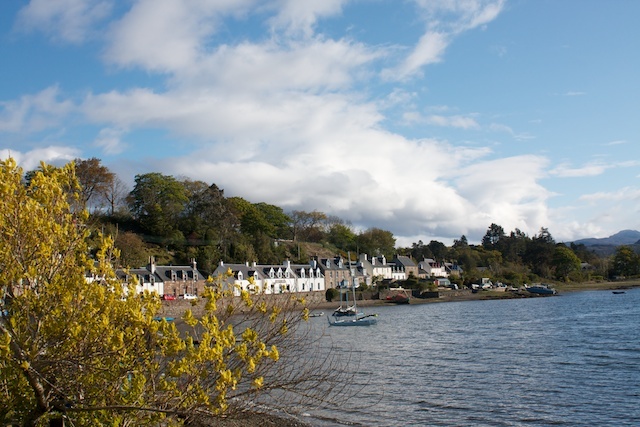 On the 2nd day of our foodie weekend in the Highlands, we moved from Applecross to Plockton, a delightful village near Kyle of Lochalsh. Like the Applecross Inn, the Plockton Inn has a good reputation for its seafood. Unfortunately, we had some car problems that day and sorting them out took a while, so we arrived fairly late. Fortunately, we had called to reserve a table – the restaurant was absolutely full. More fishy delights. 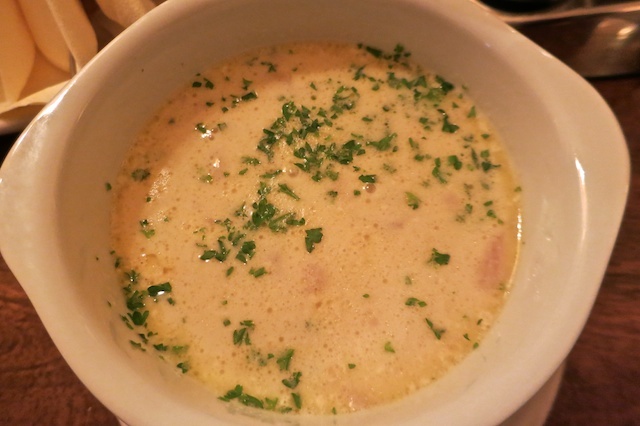 My starter tonight was crab bisque, which was a rich and tasty fish soup. My wife Anne had the langoustines and I was a wee bit jealous. 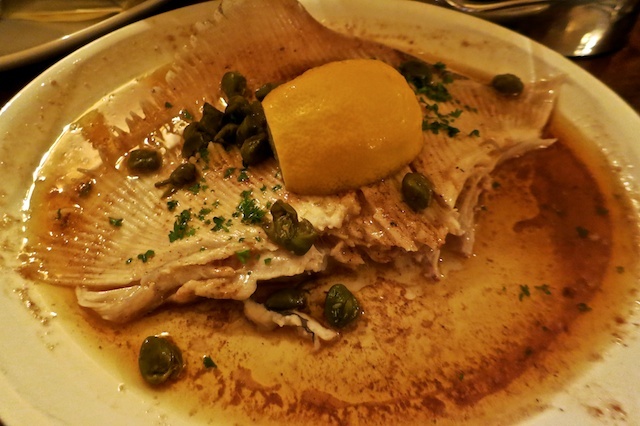 My main course was skate in black butter – a classic fish dish that you don’t see very often. Skate isn’t to everyone’s taste (or perhaps it’s a texture thing) but I enjoy it and this was a good example. Maybe rather too many capers but these were easy to leave aside. No pudding again and we repaired to the bar for excellent local Plockton Ale. Again, the prices were very reasonable for the quality of the food – we were about £22 each for 2 courses. 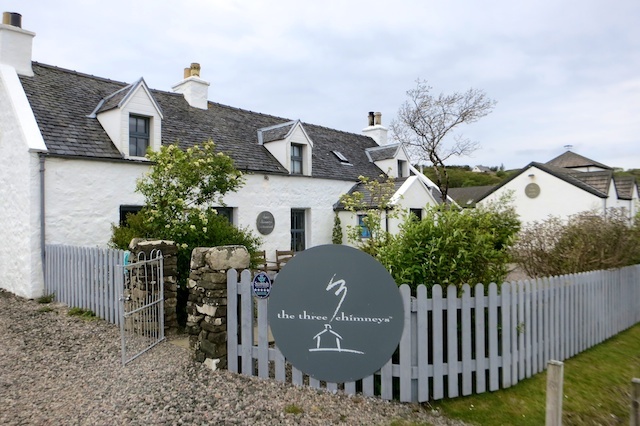 The Applecross Inn is the only pub on a very remote peninsula in the Scottish Highlands. It has a reputation for the quality of its seafood and I’d fancied going there for a while. 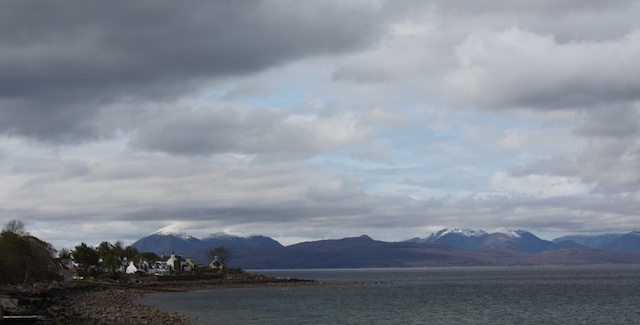 It’s a fantastic area with fantastic views to Skye. This is not a restaurant – it’s very definitely a pub with a great pub atmosphere. The daily menu is on a chalkboard and when we were there, every table was taken. My starter was squat lobster tails, which I hadn’t had before. Squat lobsters are shellfish which, according to Wikipedia, are more closely related to crabs than lobsters. 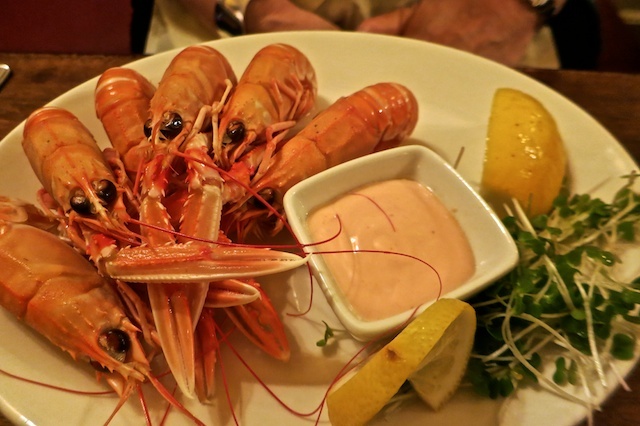 They are relatively common on the west coast of Scotland and a lot cheaper than lobster. Served with garlic butter and brown bread, they were great. 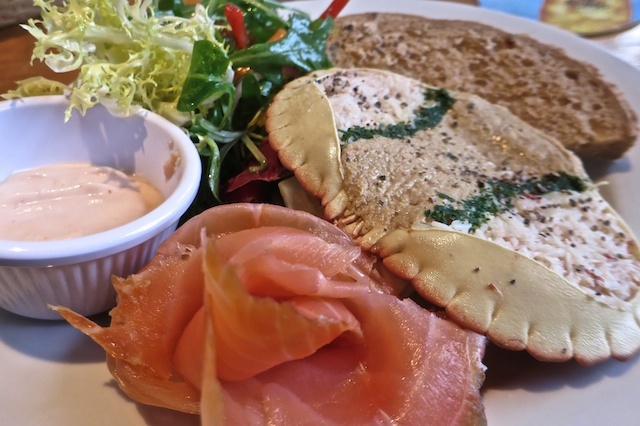 There were various fishy mains on offer but both Anne and I settled on the crab salad with smoked salmon – the crab was very fresh which makes all the difference. All too often with crab salad, the crab is a wee bit old and this really affects the flavour. No room for pudding but we did finish with a Gaelic coffee. Superb seafood and a great atmosphere. The meal was about £26 each (including the coffee) and we had a perfectly acceptable house white with it. Well worth a visit if you are in the area – and the road over the Bealach nam Ba is an experience in itself.